MACOMB, IL – Sodexo at Western Illinois University will host a "Global Chef" event Tuesday-Wednesday, Oct. 17-18 in the Thompson Dining Center and the Corbin-Olson Dining Center. The Thompson event will run from 5-8 p.m. Oct. 17, and the Corbin-Olson event will be held from 11 a.m.-1:30 p.m. Oct. 18. The events are open to all WIU students, faculty and staff, and meal plans, Rocky Dollars and cash will be accepted. The national event will share the international flavors of Sodexo and will include a campus visit by Polish Chef Lukasz Scierski, who has designed the event menus. 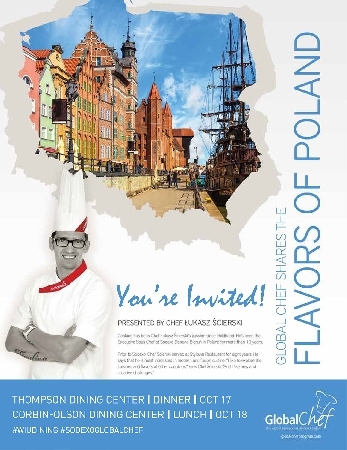 Scierski has been the executive sous chef at Sodexo Danone Bierun in Poland for more than 10 years. Prior to joining the Sodexo team, he served at Stylowa Restaurant for eight years. He is most interested in modern and fusion cuisine. "I like to explore the cuisines and flavors of other countries," said Scierski. "And I like new and creative challenges." Sirloin beef tip in a rich sauce with oyster, porcini and boletus mushrooms served over handmade parsley noodles. Salmon filet cooked in rosemary garlic olive oil and placed on top of a green pea puree. Served with purple potatoes and garnished with sugar snap peas and bacon. Red peppers stuffed with rice, mushrooms and green peas, topped with cheese. Baked diced potatoes seasoned with thyme, paprika, cayenne pepper, rosemary and olive oil. Steamed carrots coated in honey and topped with sesame seeds. Heavy cream sauce with fresh mint and dill coats sliced cucumbers. Caramelized tomatoes blended with fresh basil, mascarpone cheese and heavy cream. Homemade chocolate mousse with red chili peppers folded in and garnished with fried cherries. Short bread topped with creamy rich syrup comprised of raisins, walnuts, coconut, almonds and poppy seeds. Seasoned cabbage with applewood smoked bacon in a luscious cream sauce. Street food sandwich made with roasted pork loin, topped with cabbage, onions and a tangy sauce, served in a wheat bun. White rice combined with fresh dill and butter. Potatoes and cottage cheese are combined and cut into dumplings then coated with cinnamon and sugar. Green peas blended with sautéed leaks, shallots and parsley roots in a creamy sauce. A mixture of gelatin and beaten egg whites is then separated. Strawberry puree is folded in one and lemon zest and juice is folded into the other; then the two are layered and garnished with fresh strawberries. For more information about this event, contact Sodexo at (309) 298-1982.